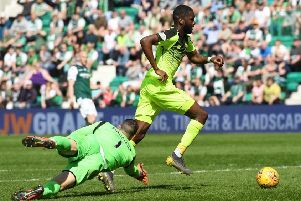 Former Hibs ace Russell Latapy is poised to make a sensational return to Scottish football at the age of 43 after signing for East of Scotland League outfit Edinburgh City. The “Little Magician” jetted into the Capital last night and immediately headed for his first training session with his new team-mates at Peffermill ahead of Saturday’s William Hill Scottish Cup second round clash with Ayrshire Junior side Irvine Meadow. The Trinidad and Tobago legend has agreed a short-term deal with the Meadowbank-based club following a chance meeting with City manager John Green after Ian Murray’s testimonial match in which he’d starred for a team of former Easter Road aces against the current Hibs team. Today Green revealed how that early morning chat in a George Street night club had helped his club pull off a major coup in persuading Latapy to pull on his boots once again. He said: “I’d got talking to Russell at the after-match ‘bash’ following Ian’s game and he genuinely seemed interested in what we are doing, the whole ethos of Edinburgh City and the emphasis we put on coaching and bringing through youngsters. However, the more Green thought of the possibility of luring such a high-profile player to his club, the more the idea grew on him, particularly the long-term benefits it would bring a squad boasting an average age of just 22. Contact with Latapy was re-established, the upshot being the former Porto, Boavista, Rangers, Dundee United and Falkirk star flying from his home in Portugal to begin preparing for his City debut. Green said: “I think my committee thought I was a bit crazy when I put it to them, but I believed Russell was sincere in what he’d said, that he was genuinely interested in what we were doing. He had said if he was available he would come over and help so I was happy to ask him again. Latapy’s arrival in Edinburgh – international clearance having been gained via the SFA from the authorities in the Caribbean – was kept a closely guarded secret with Green’s players totally unaware of what was happening until he joined them in training last night, but the City boss has no doubts the impact his presence will have. He said: “Like Franck Sauzee Russell was only at Hibs for a small number of years but both of them became absolute legends, football fans everywhere, regardless of who they supported, recognised them as something special, players people wanted to watch. And Green believes Latapy will have an impact far beyond his influence on the pitch at a club which currently has some 300 players aged between six and 19 in their youth system. He said: “It’s not about trying to pull a trick on Irvine Meadow, Russell is here for the right reasons, he’s accepted the offer to come over and help us. There are no airs and graces about him and he’s certainly not come here as some sort of mercenary but because he understands what we are trying to do. While Latapy will be passing on his expertise in training session for City’s youngsters, his presence is sure to attract a far larger than normal crowd than might have been anticipated to Saturday’s Cup tie, Green adding: “At £6 to get in and see Russell Latapy would, for me, be the only way I’d want to spend my afternoon.